Despite the ‘sky is falling‘ warnings of those who oppose open carry, the media is reporting that many businesses in Oklahoma have adopted a ‘wait-and-see’ attitude about the practice and some are downright welcoming. 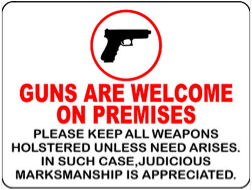 While some businesses have posted against open carry, a number have done just the opposite, posting signs welcoming legal open carriers. Casa De Los Milagros Mexican Restaurant and Cantina in Oklahoma City is one such establishment and Oklahoma gun owners should be sure to thank them for their support by patronizing their fine restaurant. As for those businesses that are still on the fence, those of us who live in states where open carry has long been the norm can tell them what to expect … nothing. Law abiding citizens will go about their business as they have always done. But now they can do it without fear of being arrested for their jacket falling open. This entry was posted in Licensed Open Carry, Media Bias, Oklahoma, Open Carry, Private Property. Bookmark the permalink.